Before I get into this, I want to commend the work of Ted Thompson and the rest of Green Bay's staff who worked very hard this offseason on scouting and really making a valiant effort in tending the Packers' needs in this NFL Draft. We were aggressive, and got exactly what we were looking for. 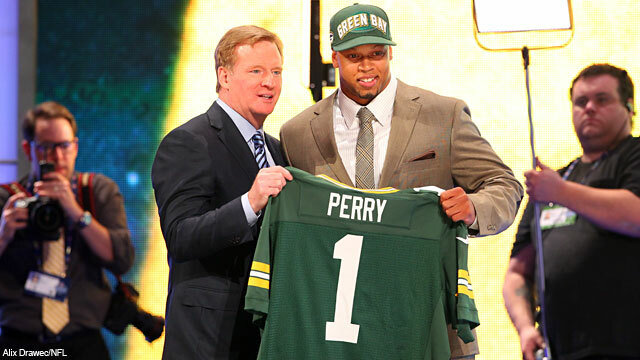 The Packers selected Nick Perry out of USC in the first round of the 2012 NFL Draft. 1st Round Pick 28: Nick Perry, DE, Southern California (6-3, 271) — With Whitney Mercilus and Shea McClellin off the board, Nick Perry was the best available pick for the Packers to take, except for Courtney Upshaw. Perry will help repair the lack of pass rush the Packers had in 2011-2012. Perry is durable, and is willing to move from the defensive end position and move to outside linebacker. 2nd Round Pick 51: Jerel Worthy, DT, Michigan State (6-2, 310) — To have Worthy available this late was an absolute steal for Green Bay. Some predicted Worthy going as the Packer's number one pick. Being 300 plus pounds, Jerel is very quick with his hands and great first step quickness as well. Some question his effort, as it seemed he only showed up at games that mattered. Hopefully he knows every game in Green Bay matters. 2nd Round Pick 62: Casey Hayward, CB, Vanderbilt (5-11, 192) — It's difficult to say how Hayward will be used in Capers' scheme. If he stays at corner, his average speed and good agility probably will move him inside to cover slot receivers in four- or five-wide formations, especially in zone looks. If he's asked to play safety, he could be effective at the Free Safety spot where he could read the quarterback's eyes and track down deep balls, and his average speed probably puts him slightly above average at safety. 4th Round Pick 132: Mike Daniels, DT, Iowa (6-0, 291) — Daniels started 21 games his final two years at Iowa and led the Hawkeyes in sacks both seasons. He was named second-team all-Big Ten by the coaches following the 2011 season. His nine sacks last year was good enough to finish third in the Big Ten. After fighting through ankle injuries as a senior, Daniels recovered to become a force by the end of the 2011 season. He led team in tackles for loss (13.5-63) and QB sacks (9-53). Daniels produced one of the most dominant defensive games in Iowa history in a late-season 31-21 win at Purdue. Daniels recorded five tackles for loss, including three QB sacks, and a career-high nine tackles. Though Daniels may not have a starting spot in 2012, he will in years to come. 4th Round Pick 133: Jerron McMillian, SS, Maine (5-11, 203) — McMillian will have to earn his keep as a special teams leader in Green Bay. He certainly possesses the size and speed to be a factor, and that could buy him enough time to develop into a role player on defense. McMillian brings a physical presence to the back end of the defense, reacts to passes well and can force his body hard in one direction to make a play toward the ball, much like he does in his reactions to the run. He is quick to diagnose run and pass, and reacts to the run much better coming toward the line of scrimmage than he does moving away. McMillian is NFL-ready in supporting the run. 5th Round Pick 163: Terrell Manning, LB, North Carolina State (6-2, 237) — The Green Bay Packers traded a sixth-round and two seventh-round picks to the New England Patriots for a fifth-round choice that turned out to be Manning on Saturday afternoon. Manning had 55 tackles, 11 tackles for loss and five sacks over his final seven games at N.C. State. Manning will be about to shadow Matthews nicely to bring back the much needed pass rush. This pick was a steal for Green Bay, as many expected Manning to be long gone by the 5th Round. 7th Round Pick 241: Andrew Datko, OT, Florida State (6-6, 315) — Datko is fast off the line of scrimmage and immediately fits on his blocks whether it be linemen or working up field. He is not an explosive mover, but he can stay with his blocks once on them. In pass protection he can struggle at times but usually blocks long enough to get the job done. He makes up for his average athletic ability by being technically sound and understanding how to use his hands and feet to keep defenders occupied. He works hard to keep defenders moving in the run game and, despite his weaknesses, is a "get the job done" player at the end of plays and games. 7th Round Pick 243: B.J. Coleman, QB, Tennessee-Chattanooga (6-3, 233) — When the Green Bay Packers drafted B.J. in the seventh round Saturday, Coleman told coach Mike McCarthy this would be the best pick they ever made. Coleman is intense. The game consumes him. Every red-blooded, mid-'90s kid in Tennessee dreamed of being Peyton Manning. But Coleman took the challenge seriously. Coleman originally attended Tennessee with Manning's career arc in mind. But when Lane Kiffin demoted Coleman for Jonathan Crompton in 2009, he transferred to Chattanooga. A film-room hermit, he needed to play. And in three years, Coleman threw for 6,871 yards, 52 touchdowns and 31 interceptions. Jaymes Brooks, G/C, Virginia Tech (6-2, 307) — A three-year starter at right guard for the Hokies, Brooks was also named second-team All-ACC twice. He’s versatile enough to play all three interior offensive line positions, but most teams considered him too small to play guard at the NFL level. He played in a zone blocking scheme at Virginia Tech. If he shows something, the Packers may consider grooming him as their future center. They definitely like versatile offensive lineman. Dale Moss, WR, South Dakota State (6-4, 215) — Moss played basketball for four seasons before playing one season of football at SDSU. He’s extremely raw, but a great athlete with size and leaping ability. In his one season of football, he led the Jackrabbits with 61 catches for 949 yards and six touchdowns. He has great potential, but needs to put on more muscle. Could be this year’s Tori Gurley. Don Barclay, OT/G, West Virginia (6-4, 305) — A two-year starter at left tackle for the Mountaineers, Barclay was named first-team All-Big East by the coaches in 2011. He’ll probably play guard at the pro level because of his size. Unfortunately, that’s about all we know about him. It doesn’t seem like he was scouted heavily and that probably means it’s unlikely he’ll make an NFL roster. Sean Richardson, SS, Vanderbilt (6-3, 216) — Projected by CBS Sports as a seventh-round pick, Richardson was a three-year starter for the Commodores. He had 63 tackles, including 6.5 for a loss his senior season. He also had one interception and a sack. Coverage isn’t a strong suit, but he plays well against the run. Richardson actually considered coming out after his junior season. The Packers will reportedly convert him to linebacker. Nic Cooper, RB, Winston-Salem State (5-9, 249) — Cooper put up some impressive rushing stats at Division II Winston-Salem State. He ran for 1,808 yards and 22 touchdowns in 2011, averaging 6.8 yards per carry while leading his team to a 13-1 record. It doesn’t look like that will matter in Green Bay, though. The Packers will convert Cooper, who left school with a year of eligibility remaining, to fullback. Dezman Moses, DE, Tulane (6-3, 248) — Moses was a second-team All-Conference USA selection in 2011 after recording 52 tackles and 9.5 sacks for the Green Wave. He started his college career at Iowa before transferring to Tulane, where he was a two-year starter. Moses will transition to outside linebacker in Green Bay. He’ll likely need to put on some muscle to compete at the NFL level. Dion Turner, CB, Southern Utah (6-0, 195) — Turner was a first-team All-Great West selection his senior season. He only started playing football his senior year of high school. He played safety before switching to cornerback in college. Unfortunately, we don’t know much about him because he played at Southern Utah. Marc Tyler, RB, USC (5-11, 230) — Tyler split time in the USC backfield in 2011, rushing for 568 yards and four touchdowns. He averaged 4.7 yards per carry. His best season came in 2010, when he ran for 913 yards, nine touchdowns and averaged 5.3 per carry. Tyler was suspended for the first game of the 2011 season for making what were considered inappropriate comments about athletes getting paid at USC. Tyler obviously has some talent and he also has the USC pedigree. Could push for a roster spot, just like Brandon Saine did last season after going undrafted out of Ohio State. Drew Vanderlin, DE, Michigan Tech (6-4, 280) — Vanderlin, who played at Green Bay Southwest, had 20 career sacks for the Huskies. He finished the 2011 season with 33 tackles and 6.5 sacks while earning first-team All-GLIAC honors. Vanderlin projects as a defensive end in the NFL, but seems better suited for a 4-3 defense. He’ll need to bulk up considerably to have a shot at playing end in the Packers 3-4, which already has a pretty crowded defensive line group. Eric Lair, TE, Minnesota (6-3, 232) — Lair looks like he was the forgotten man in 2011. A year after catching 39 balls for 526 yards and two touchdowns, Lair caught only 11 balls for 168 yards and one touchdown in 2011. He put those numbers up in eight games. There seems to be some question as to Lair’s position as well. Although he played tight end in college, he may be converted to a fullback/H-back in the NFL. Tommie Draheim, G, San Diego State (6-4, 305) — A first-team All-Mountain West selection in 2011, Draheim played left tackle in college. He was a three-year starter for the Aztecs. Draheim is limited athletically and lacks footwork to play left tackle in the pros, which is part of the reason he’s being projected as a guard. Duane Bennett, RB, Minnesota (5-9, 205) — Bennett was a pretty average back for the Gophers, rushing for 639 yards and three touchdowns his senior season, while averaging 3.8 yards per carry. He’ll need to show something on special teams to have any shot of securing a spot in the NFL. Cameron Ford, TE, Wake Forest (6-4, 255) — Ford recorded only 12 receptions for 99 yards and three touchdowns his senior season, his first as a regular starter. Ford is another guy who’ll have to show a lot on special teams to have any shot at making an NFL roster. Marcus Rivers, WR, Buffalo (6-5, 220) — Rivers recorded 60 receptions for 615 yards and two touchdowns in 2011 with Buffalo, the alma mater of James Starks. He was named second-team All-Mid-American. Rivers isn’t fast, but he’s an imposing target at 6-5 and uses his body well.